a nice sour but, for me, just OK. 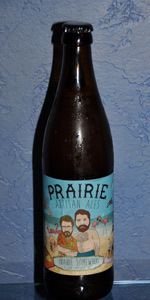 I LOVE Prairie and just felt that, as sours go, this might have been more? Something, can't put my finger on it but just.......... I measure all sours to the Funkatorium in Asheville and that's a tough measure. Purchased online and poured into a teku. Smell and taste like citrus and lime, with note of orange. Very sour, but not overly so. A good balance for an excellent saison/farmhouse Ale. Definitely worth it. S: Smells of sourness and funk with some peach like fruitiness. A little spice and honey at times as well. T: Taste is peaches with some nice tartness, slight funk as well along with some spice notes. Swallow is a nice sourness with some lingering fruitiness and a little funk. M: Fairly light on the palate but it isn't watery. Carbonation on this beer is a little prickly but it isn't too bad. The beer also has a drying finish from the acidity. O: Overall this is a really nice sour beer. It isn't bracingly sour but it has a very nice pucker. There are some nice flavors to this beer as well and the complexity is pretty solid. If you like sour beers but don't like them to be super sour this is one to try. Cloudy golden tan color with a head that kept going but went away quick. Strong tart sour scent. Tangy citrus pepper scents in there. Taste like a saison and a sour mixed together. Has that Belgium yeast but also some sour citrus pepper in there. Medium light body with a lot of carbonation. Very different and good farmhouse sour.